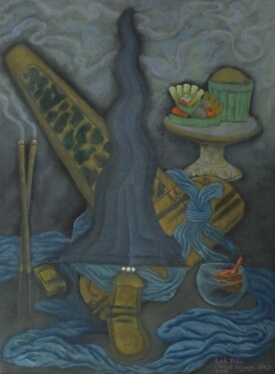 Tumpek Landep is an expression of gratitude devoted to Ida Sang Hyang Widhi Wasa in the manifestation as Sang Hyang Pasupati, for the grace of sharpness of mind to mankind in carrying out life, using metal objects to gain welfare and prosperity. Luk Pitu. Bali, 2018. Oil on Canvas, 60 x 80 cm. The sharpness of mind is like a weapon that provides protection and facilitates activities, such as Keris and Tombak. Tumpek Landep day is celebrated every 210 days according to Balinese Calendar and fall on Saturday or Saniscara Kliwon Landep. This tradition has been inherited up till now and has grown, not only limited to heirloom weapons, but also objects containing iron or metal such as agricultural equipment and kitchens, vehicles, and others. These objects have helped and facilitated mankind in carrying out their activities or daily work. The ceremony is held in the morning to afternoon, starting with collecting heirloom objects (weapons). The heirloom weapons are cleansed with flower oil, laid out along with other equipment, complete with prepared offerings. And then people come together for prayer and blessing. The Balinese believe that this ceremony and blessing will bring happiness, prosperity, luck and salvation to them. It is a tradition in Bali, that appreciating something (in this case keris, heirlooms, and other objects) indirectly also means respecting ourselves, appreciating an ancestral heritage. For Balinese, Keris is considered vital, sacred object with magical power. With a good treatment, it will bring protection and happiness for the whole family. Guides, Insight (May 3, 2016). "Insight Guides Indonesia". Volume 277 of Insight Guides. Apa Publications (UK) Limited. ISBN 9781786710314. Retrieved February 16, 2018.